The housing crisis in Galway city is worsening with 17 new families joining the homeless list in the city over the past eight weeks. Describing it as accurate and depressing, COPE Galway has confirmed that the latest family homelessness figures for the city show that there are currently 76 families in emergency accommodation and they are struggling to meet the demands to keep a roof over their heads. To this end, COPE Galway is appealing to anyone who has housing and accommodation available which could be used to house those so badly in need of a place to live to get in contact. Reacting to the publication of the latest homelessness figures by the Department of Housing earlier this week, COPE Galway said the reported increase in the numbers of families homeless and in emergency accommodation in the West Region is in fact a more accurate – and depressing – reflection of the actual situation on the ground compared to previous monthly reports. A total of 82 families including 218 dependents are reported as having been homeless in the March 2018 figures for the region which covers Galway city and the three counties of Galway, Mayo and Roscommon. This is an increase on what was reported for February 2018 which stood at 49 families and 146 dependants. The March figures also show an increase in the numbers of adults overall who are homeless in the west region, up to 280 from the February figure of 254. There was a delay in the publication of these figures which was attributed to a problem with how the figures were being computed. 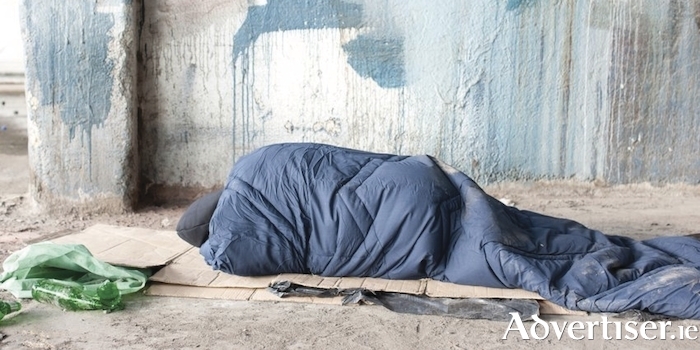 “We are continuing to see homelessness increasing in Galway city and county with the numbers in emergency accommodation higher than ever before,” said Martin O’Connor of COPE Galway. “Over the past two months we have seen a marked increase in the number of families presenting as homeless and in need of emergency accommodation and we are struggling to find emergency short term accommodation for these families. The Government had set a target of ending the reliance on hotels and B&Bs to accommodate families by the middle of 2017, a target that was not met, including in the West Region. “There are now a further 12 families in contact with our services who are waiting for emergency accommodation to become available and who are living in overcrowded situations with family members and friends in the interim” said Mr O’Connor. “2018 is already looking like it will be the most challenging year yet due to an acute shortage of housing resulting in many of the families and individuals who become homeless remaining so for extended periods of time”. The slow pace of delivery of social housing across both Galway local authorities has been the subject of media coverage in recent times with the Housing Minister Eoghan Murphy reported to have written to the CEOs of both local authorities about accelerating the delivery of social housing in both the county and city. “We welcome any measures that can be taken to bring more social housing on stream as this is the most appropriate response to the housing needs of so many of the families and individuals we work with on a day to day basis,” concluded Mr O’Connor. Meanwhile, COPE Galway continues its appeal to hear from anyone who has housing and accommodation available which could be used to house those so badly in need of a place to live. You can contact Martin O’Connor or Jacquie Horan to discuss options on 091 778750.